I love rhubarb season. It's that vivid pink colour, tangy taste and the creative baked concoctions which come as a result. 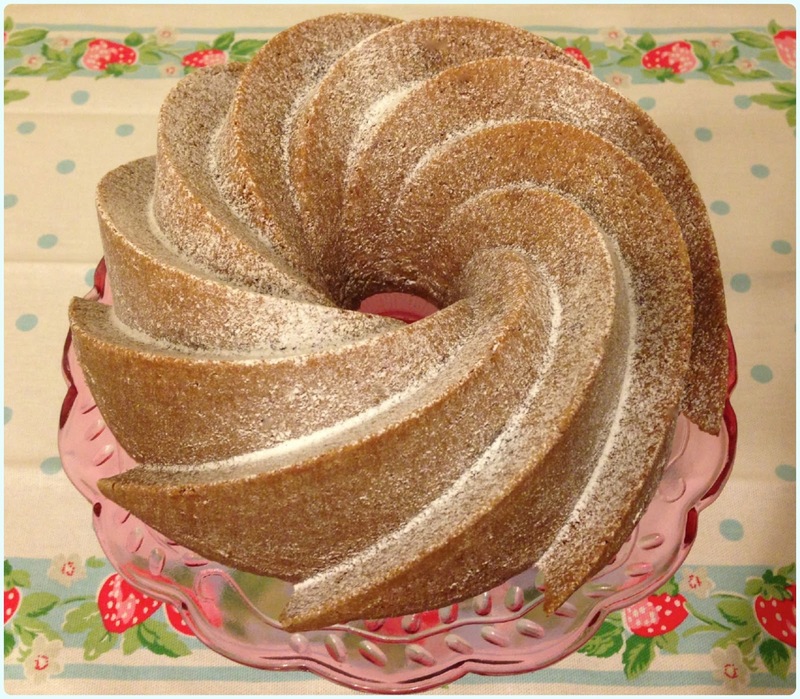 We had the most amazing rhubarb jelly at St John in March, so I decided to translate this into a bundt! This cake has a beautiful soft texture, is amazingly moist, has a warm spiciness and is rippled with wonderfully tart ribbons of rhubarb. This went down very well with the tame tribe of bundt ginuea pigs at work today! Cream the butter for a little while until pale, then add both sugars a little at a time. Beat until fluffy. Sift in a third of the flour mix, followed by half of the yogurt. Repeat until all the flour and yogurt is used up. Pour enough mix into the tin to cover the bottom. Put a layer of compote/jam on top, avoiding the edges. Put on another layer of cake mix and repeat. TIP: a less faffy way of doing this is plunging teaspoons of the compote into the mix avoiding the sides. This will be more of a splodge effect than the stipes I did. Just avoid the tin edges. Another beauty Rachel! I'm always so envious of your vast collection of Bundt tins! This was the first one I ever bought! Thanks Dom! It has to be one of my faves so far! What a beautiful looking cake! I love rhubarb so this is a must try! My work friends loved it! Hm....this looks so yummy and perfect! This looks amazing! Love rhubarb and your finished cake looks totally fab! I'm putting this on my "to bake" list! Oooh this looks gorgeous! I love the ribbons of rhubarb running through it. I need to take my "matilda" tin out for a spin again, it's such a great shape. Haha I love the fact that I've got everyone calling the Heritage tin Matilda!